Winners of the CBCA book awards for 2010 · Readings.com.au. 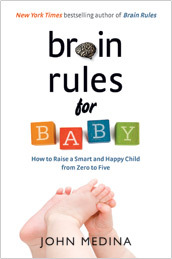 Brain Rules: 12 Principles for Surviving and Thriving at Work, Home, and School by John Medina looks like a very useful reference for anyone interested in how brains learn. Medina is a developmental molecular biologist and he has very generously shared some of the principles in an interactive presentation online. Open the link below, watch the video and then scroll down to the 12 rules and explore each one, checking out the graphs and videos as you go. He’s got some challenging criticisms of how schools make learning more difficult but he’s got the science on his side! via Brain Rules: 12 Principles for Surviving and Thriving at Work, Home, and School | Brain Rules |. PS The book is being released in October. I am indebted to Rosemary Sorensen from The Australian, for the news that Freya Blackwood has won the 2010 Kate Greenaway Medal. In a full feature article entitled Picture Perfect, Sorensen profiles the artist and some of the children’s books she has illustrated. What you can’t see in the online version of this article are the charming illustrations from Harry and Hopper. 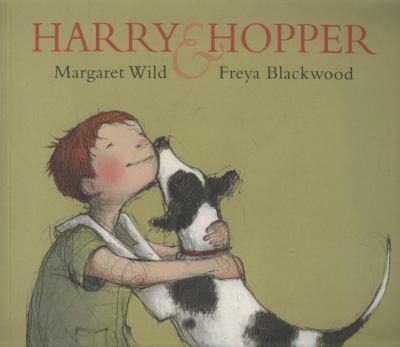 This is a lovely book by Margaret Wild, about coming to terms with the loss of a pet. The watercolours featured in the Sorensen article are scenes of ordinary domestic Aussie life: the kid playing rumbustious games with a lively black-and-white dog in the big backyard, while in the background an androgynous parent is hanging out the washing, rolling up the hose, bringing the groceries from the car. They are perfect. By coincidence this week I have been reading Libby Gleeson’s Harry and Millie and the Very Fine House. It’s on the CBCA shortlist, and for once I have no reservations about the suitability of the books they have chosen. Freya Blackwood also illustrated this thought-provoking story about a little boy whose parents move from an inner-city Victorian home to a McMansion with vast spaces and an emptiness that intimidates Clancy. ‘It’s too big’, he whispers’, but his mother is ‘already gone’, vanished into its huge and soulless chambers where she cannot hear him. The isolation of children within these cavernous houses was never so poignantly depicted! What Blackwood also shows with the monstrous pile of packing-boxes that the children play with is the unconscionable consumerism that is associated with these McMansions which proliferate in the outer suburbs but are coming like a creeping cancer to destroy the middle suburbs too. The train that the children build with the boxes stretches out of the garden and into the street – but the most arresting image is the crazy tower that they build. It is fractured, destined to fall apart, like the communities isolated in suburbs full of these monoliths. Clancy calls his packing-box-house ‘a very fine dwelling’ and that’s what Dad calls the new house too: it’s not a home. With older children reading this book, I explore Dad’s absence from the grand tour of the empty rooms. Mum is exultant about the huge shiny kitchen, but Dad is nowhere to be seen. 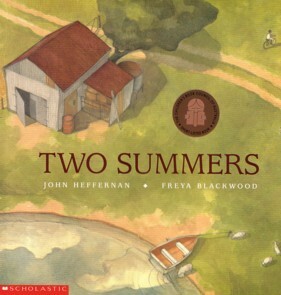 Another book I use a lot in the library is Two Summers by John Heffernan. This brilliant story of a city kid who visits a friend on a farm ravaged by drought is one of the best books I have for the unit I teach about farming. Blackwood’s illustrations tell the story of Australia’s cruel droughts with graphic but not gratuitous detail, but the story also shows the indefatigable spirit that characterises outback life. The partnership of Margaret Wild and Freya Blackwood is also featured on the 2010 NSW Premier’s Literary Award page about the Patricia Wrightson’s Award for Children’s Literature.